We welcome you to the November issue of INSIDE ATLAS.ti. This issue contains news items and an overview of the training activities scheduled for the months of November and December. 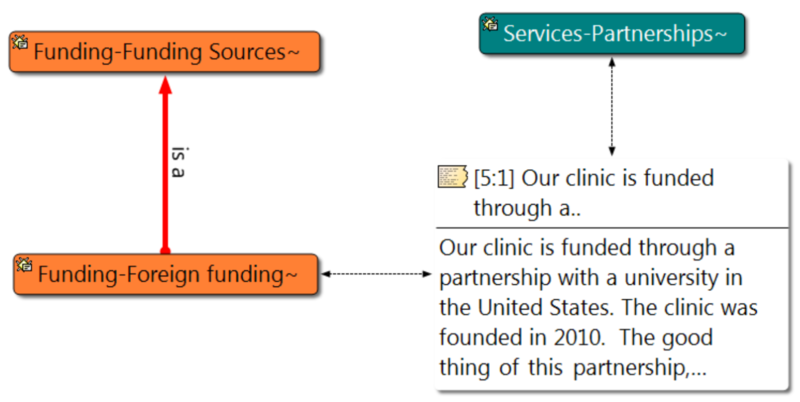 In the Best Practices with ATLAS.ti section, we publish an article examining the importance of diagramming in ATLAS.ti, including examples from the Windows and Mac versions of the software. In the Case Studies with ATLAS.ti section, we offer you an interview with Dr. Edward Larkey, who discusses the way he has employed ATLAS.ti Mac in the analysis of television episodes. In this study, Dr. Larkey analyzes video documents. We hope these two articles give you insights into how to best utilize ATLAS.ti. We would like to congratulate our three raffle winners who attended the Qualitative Health Research Conference (QHR) that was held in Toronto October 19-21. Linda Liu, from Ryerson University, Jonathan Avery and Chantalle Clarkin, both from the University of Ottawa, each won a single-user educational license. ATLAS.ti is gold sponsor at the Southeastern Library Assessment Conference, USA. ATLAS.ti is proud to be a Gold sponsor of the Southeastern Library Assessment Conference to be held on November 16 – 17 in Atlanta, Georgia, USA. The conference provides an important opportunity for those interested in advancing the library assessment and user experience conversation to gather together to discuss practical ideas and information. We would like to invite you to share with us your experiences using ATLAS.ti. We will ask you a few questions about you and your organization, the research you do, and the way in which you have used ATLAS.ti, as well and a couple of photographs related to your work. To complete the questionnaire, click here. Thank you! Visit our new ATLAS.ti online shop by clicking here. We have put a great deal of thought into it in order to provide you with a quick and easy access to our products. After having re-launched the ATLAS.ti website, our online shop shines from now in the same light. Its clean design and lean layout make it a joy to look at and use. Check it out for yourself. We are convinced that you will not waste any time when purchasing our products. ATLAS.ti certifies the knowledge and experience of students and professionals who want to provide training services in ATLAS.ti. The Certified ATLAS.ti Student Trainer program (CAST) provides certification to those students who are using the software in their theses and dissertation projects, so they can introduce their peers to the basics of the program. To apply, click here. Our Certified Professional Trainer program (CAPT) provides certification to those seasoned academics and researchers who are using ATLAS.ti in their research projects and can demonstrate a high level of expertise in the use of the software. To apply, click here. All certified instructors become part of a network of ATLAS.ti trainers and consultants and qualify for special support from us. If you have any questions, do not hesitate to contact us by writing to [email protected]. 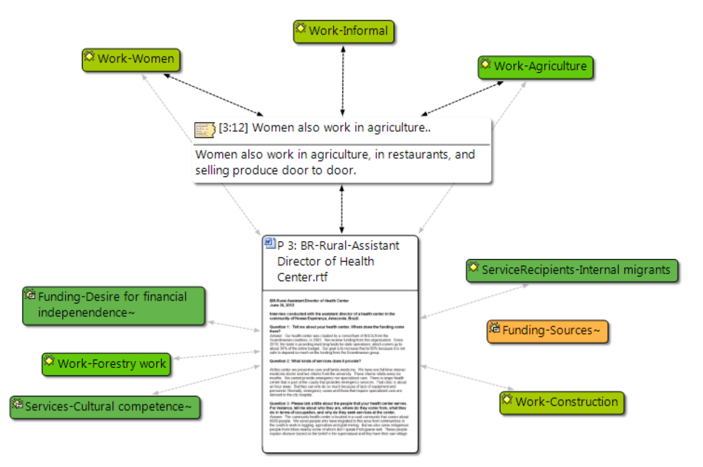 ATLAS.ti offers a variety of resources that facilitate the learning of the software. These include a complete library of video tutorials, weekly webinars, workshops of different kind, and a set of manuals and how-to documents. For more information on our learning resources, do not hesitate to contact the staff of our training center. They would be happy to assist you. In the United States and Canada, you may call us toll free 1-866-880 0231. If calling from other countries, dial +1-541-286-4391. You may also write to us at [email protected]. You may access all of our training resources on our website by clicking here. If your organization is evaluating ATLAS.ti or you want to introduce it to your students or at a professional meeting, schedule a presentation with one of our instructors. We would be happy to tailor the presentation to your needs. To schedule a presentation, please complete this registration form. For group demo webinars in the Spanish language, complete this form. About once a week, we present overview webinars in the English and Spanish languages. These webinars are offered at different time zones, thus meeting needs of users worldwide. The English language webinars are offered at EST (New York) and SGT (Singapore) time zones. The Spanish language webinars are offered at CEST (Madrid) and ART (Buenos Aires) time zones. Once you click on the registration link, you will be given the option of showing the webinar time using your own time zone. To see our schedule, and to register, click here. In previous Newsletter and blog articles, I have discussed data-level work in ATLAS.ti. I have highlighted the benefit of commenting, renaming and hyperlinking quotations; and have discussed several of the day-to-day operations involved in coding. In this issue of the newsletter, I will discuss diagramming and visualization of linkages and relationships. These processes have to do with data analysis, but they also complement data-level work. 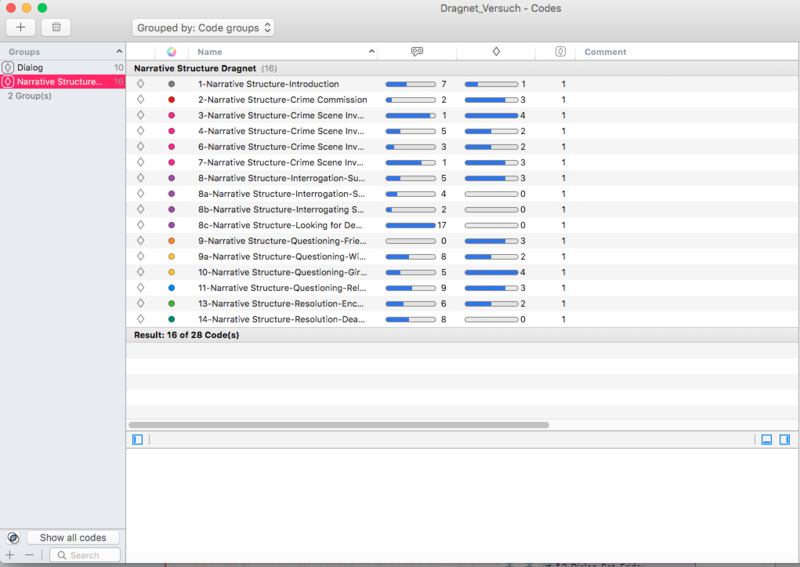 Indeed, as I will argue in a future article, good data-level work requires the fluid integration of segmentation, coding, writing and diagramming. Network view of a document family in ATLAS.ti 7 Windows. Network view showing code-to-code semantic linkages in ATLAS.ti Mac..
Network view showing a combination of unnamed and named linkages in ATLAS.ti 7 Windows. In this issue of INSIDE ATLAS.ti , we interview Dr. Edward Larkey, Professor of German Studies and Intercultural Communication at the University of Maryland, Baltimore County, in the United States. In the interview, Dr. Larkey discusses the use of ATLAS.ti Mac in television studies. We hope you enjoy it! I received my MA in Modern German Literature at the Philipps-Universität, Marburg, Germany in 1978, and my Dr. Phil in Kulturwissenschaften (Cultural Studies) at the Humboldt-Universität in Berlin (GDR) in 1986. My dissertation was entitled “Zur kulturpolitischen Rezeption der Rockmusik der USA in der DDR” (“The Influence of US Rock Music on the Cultural Policies of the GDR”) and was a discourse analysis of major East German publications on their reactions to the influx and popularity of Western (mainly US and British) rock music on the cultural policies of the East German State. My hypothesis was that the GDR was forced to establish a new popular music industry to counteract what it considered to be deleterious influences and popularity of Western music. This necessity ran counter to its declared intention to create an alternative music to those influences. A further book continuing that topic and incorporating documents that had been inaccessible prior to the fall of the Wall was published in 2007 as Rotes Rockradio: Populäre Musik und die Kommerzialisierung des DDR-Rundfunks (“Red Rock Radio: Popular Music and the Commercialization of GDR Radio”) (LIT-Verlag-In German). My research involved the collection of ethnographic and historical data, interviews and archived documents pertaining to the above-mentioned topic(s). Currently, I have shifted my research to the field of television studies and cross-cultural analysis of television series that have originally been produced in one country, but reproduced in others and therefore adapted to the culturally specific conditions of that country’s broadcast sphere. I am directing a research group comprised of doctoral, masters, and undergraduate students, each of whom are comparing different television series, i.e., two different versions of the same series focusing on the pilot episodes. The research project using ATLAS.ti will make a substantial contribution to the field of global television studies, which until now has neglected to investigate quantitative dimensions of televisual identity narratives inherent in the use of time. 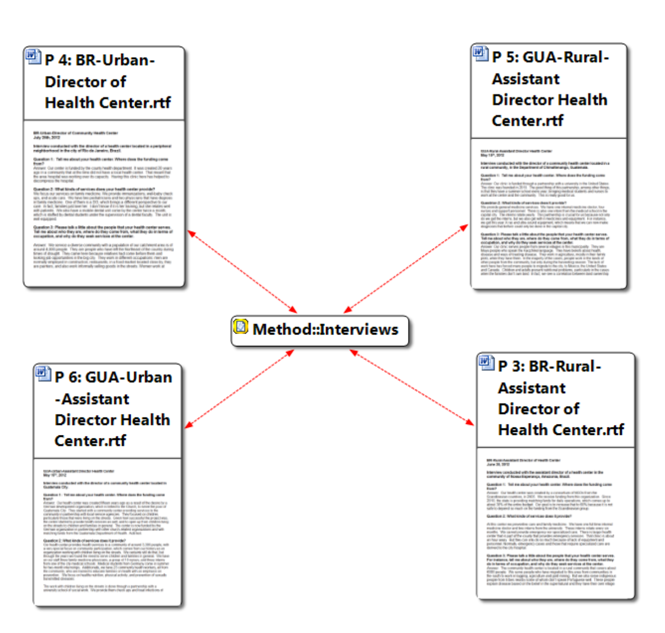 Previous research in the field has focused on content analyses and qualitative data, while quantitative data was primarily drawn from audience reception studies. The research based on ATLAS.ti will focus instead on the quantitative dimensions of the televisual texts produced under the economic, political, and cultural constraints of each national television industry. While much theoretical research has postulated the significance of time in the construction of identity narratives (Monaco 2000; Bordwell 1985; Metz 1974) in cinema studies, there have been no concrete applications of these ideas to broadly incorporate quantitative data into interpretive analyses of television and to the much more constrained conditions of transnational televisual narratives and their comparison. Therefore, our ATLAS.ti-based research represents an innovative approach to film and television analysis, particularly within the framework of transnationally constituted national identity narratives such as the television format adaptations. These represent an increasingly significant aspect of media globalization that both homogenizes as well as helps distinguish hybrid national and transnational cultures and discourses. It is possible to assemble these data using software such as ATLAS.ti to cross-culturally define, visualize, and compare what we are calling a “televisual language.” Thus, ATLAS.ti and other types of video editing and analysis software can be used to quantitatively measure transnational processes of globalization focusing on the specific case of television formats. One of the results of our research has been to develop a typology of adaptations based on narrative structure, content, and sequencing which we have derived from examples of our research group participants: Our comparative analysis of the US series The Nanny with five different other versions (Argentina, Poland, Russia, Greece, Turkey) demonstrated that this series retains the narrative structure, length, and sequencing of the original with no change, but incorporates various aspects of cultural proximity in the adaptation related to specific institutions, cultural, political, and social practices in each country to enhance audience identification. The Turkish adaptation of the US series Monk (called Galip Derviş ) revealed that the greater length of the Turkish series (74 minutes vs. 44 minutes) prompted the Turkish producers to extend, expand, and supplement the narrative beyond what was produced in the original episodes, but retain the same narrative structure and sequencing of the original. A comparison of the French reproduction of the Quebec TV series Les Bougon entailed a redistribution, restructuring, and re-ordering of the Quebec original narrative structure and sequencing to accommodate the 52-minute time slot in France compared to the original 24-minute slot. This resulted not only in a change of genre from sitcom to dramedy, but also a transformation of the narrative content. Contrary to the episode-based adaptations of the three previous examples, my own work comparing the German adaptation of the US 1950s crime series Dragnet exemplifies a genre-based adaptation that differs radically from the original version, modifying the narrative structure and content, but retaining the genre structure, intention, idea, characters, and music of the original. ATLAS.ti can assist in the deconstruction of the narrative into separate segments of the multimodal communication. The primary documents in our analysis consist of the video of the respective television episodes, which we currently portray in ATLAS.ti in one region of the screen. Our research group uses the coding functions to quantitatively delineate and structure the length and duration of each scene (determined by the change of location of camera shots) of the episode to arrive at a numerical quantity of time for each one. This duration can be depicted in a Microsoft Excel chart in both absolute numbers as well as percentages of total time of the episode and scenes. 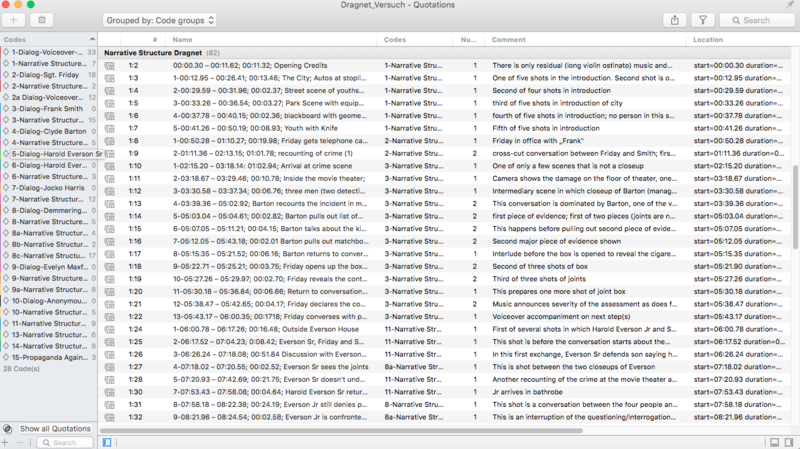 The quotation function can be used to compile quantitative data on aspects of narrative shared by both versions of the episode. For the Dragnet and Stahlnetz episodes this includes the different steps and sequence in the collection of evidence and the apprehension of the perpetrators of the respective crimes. For the narrative structure the quotations are used to delineate the different camera shots, music segments, dialog portions in each case. These will be later correlated with each other using the co-occurrence function of ATLAS.ti. For instance, the Dragnet episode entitled “The Big Seventeen”, which can be seen as an illustrated radio play, employs the narrative device of the voiceover to a much greater extent than the 1958 German episode of Stahlnetz entitled “Die blaue Mütze” (“The Blue Cap”), which adapts a film aesthetic for television. ATLAS.ti allows us therefore to determine the position, function, and length of voiceover segments used in each of the versions based on timecode information (as quotations) and use this information for comparative analysis. If and how the divergent use of voiceover is related to the diegetic vs. mimetic approach to each different version. Quotations can also be used to label and quantify the length and combination of camera movements, angles, and shots and correlate these with the narrative structure. Quotations can also be employed to mark off different segments of music and scoring, as well as dialog. 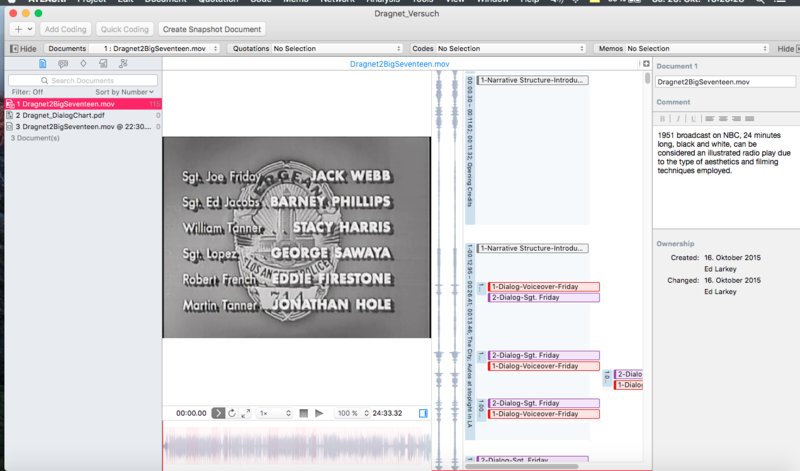 Each of these aspects (dialog, music and scoring, and camera work) represents the groups of our analysis. We are hoping to soon use the co-occurrence tool of ATLAS.ti to correlate our data on narrative structure, sequencing, and content with those of the camera work, dialog, and music and scoring. 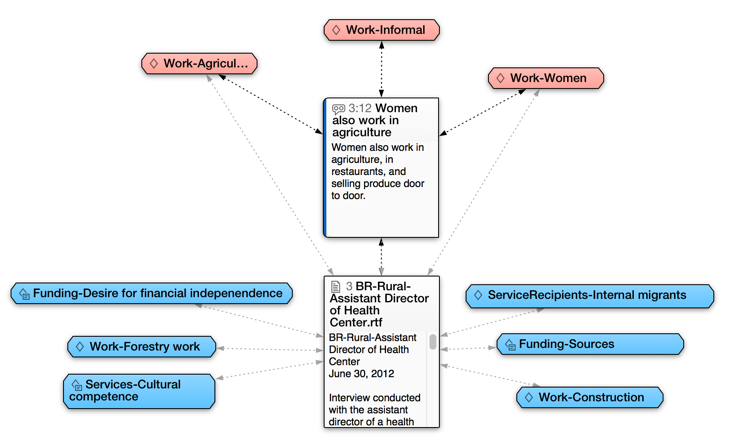 The network and hyperlink function of ATLAS.ti is a useful way of depicting the relationships in the narrative structure and the progression of scenes of the narrative from beginning to end. These can also be used for illustrating individual aspects of the narrative. One example of this is to compare the length of time devoted to the collection of evidence (marijuana cigarettes in Dragnet and the blue cap in Stahlnetz ) in each version, or the amount of time it takes from discovery of the main perpetrators to their final arrest. Our work with ATLAS.ti is approximately in the middle of the first step, in which we are still in the data gathering phase of depicting the narrative structure for each of the investigated episodes. The next step (number 2) will be to gather further data (quotations) on the dialog and then the step after that will be to correlate the data of the narrative structure with the dialog to arrive at specific co-occurrences. 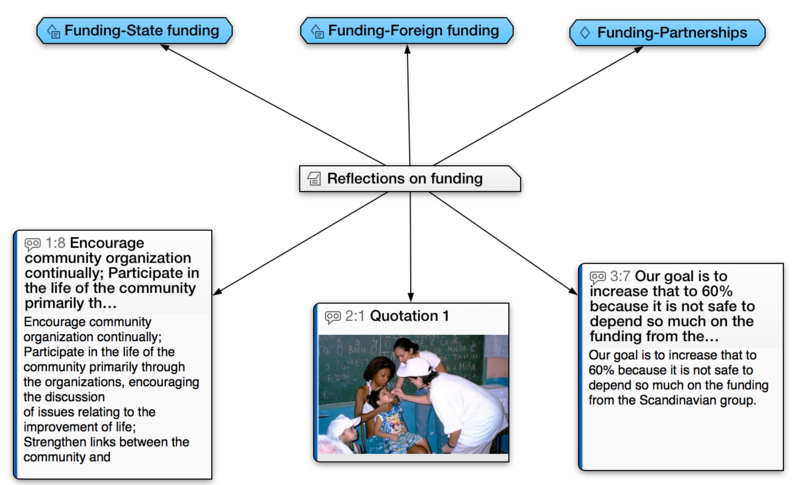 Initial work with the dialog segments indicates that each sentence or group of sentences in the dialog will become a part of the ATLAS.ti quotation. In addition, my initial work with the voiceover segments has prompted me to develop a numerical coding to indicate placement in scene, length of voiceover, and frequency of voiceover in that scene. I have not completed this task, however, and will not be including this in this summary overview of the work. Finally, we have not yet worked with memos, so that is not included in this as well. Appendix A. 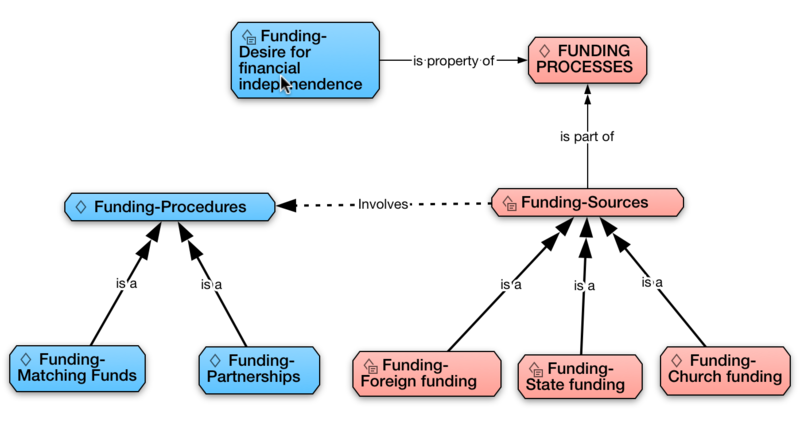 Images showing how ATLAS.ti was used in the project data analysis. 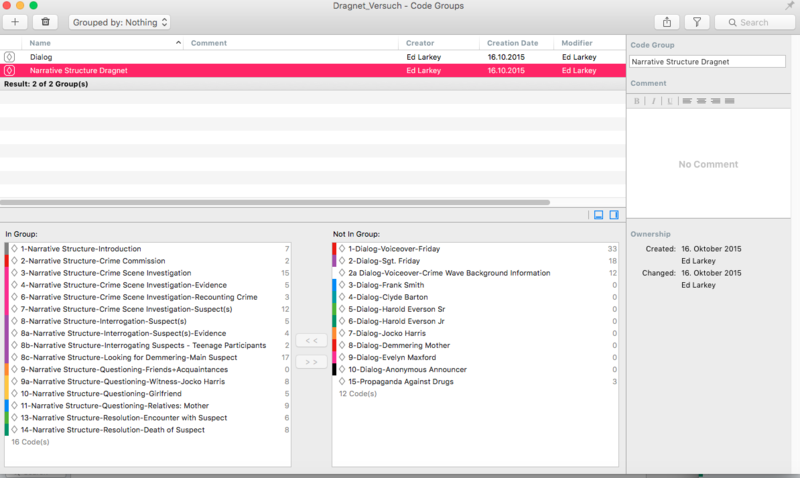 Document work area of 'Dragnet', showing timeline, quotations, codes and comment. 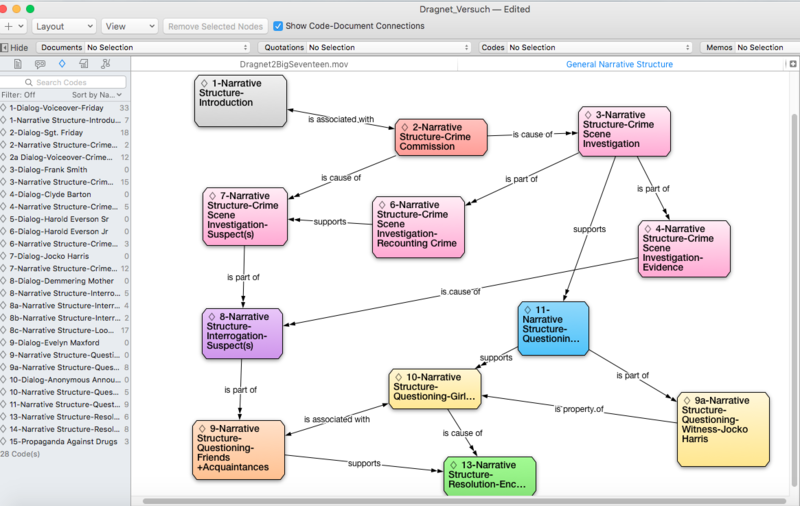 Network of the Dragnet narrative structure, with hyperlinks. Bordwell, David, 1985. Narration in the Fiction Film, Madison: University of Wisconsin Press. Hofstede, Geert, 2001. Culture’s Consequences – Comparing Values, Behaviors, Institutions and Organizations Across Nations, Thousand Oaks: Sage Publications. Hofstede, Geert, 1980. Culture’s Consequences – International Differences in Work Related Values, Newbury Park: Sage Publications. Metz, Christian, 1974. Film Language. A Semiotics of the Cinema. Translated by Michael Taylor, Chicago: University of Chicago Press. Monaco, James, 2000. How to Read a Film. The World of Movies, Media, and Multimedia, New York: Oxford University Press.